Otosclerosis occurs when bone remodeling is abnormal. Ears are a complex part of the human body, and as such there is a lot which goes into their function and understanding their workings. In this blog, Otosclerosis and its symptoms and causes will be explored. Otosclerosis is a condition caused by abnormal bone remodeling in the middle ear. Bone remodeling is an on ongoing process which occurs throughout a person’s life, during which old tissue is replaced with new tissue. When someone has otosclerosis, abnormal bone remodeling gets in the way of sound travelling from the middle ear to the inner ear, and may block its path entirely. This condition, which results in hearing loss, affects more than 3 million Americans and it is mostly thought to be an inherited condition. White, middle aged women tend to be the most at risk for otosclerosis. How Does Normal Hearing Work? Healthy hearing relies on a series of events that change sound waves travelling through the air into electrochemical signals inside the ear. The auditory nerve then carries these signals to the brain. 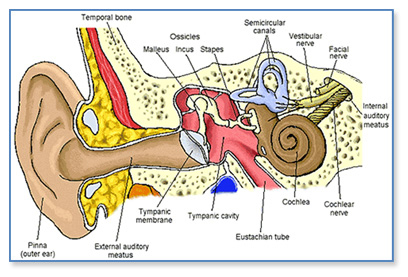 Sound waves enter the outer ear and travel through the ear canal, which then leads to the eardrum. These incoming sound waves make the eardrum vibrate, and these vibrations travel to three tiny bones in the middle ear. These important bones are called the malleus, incus, and stapes. The middle ear then amplifies these vibrations and they travel to the inner ear, where the vibration of fluid in the cochlea leads to a chain reaction causing an electrical signal to be carried to the brain by the auditory nerve. This condition is caused when one of the bones in the middle ear get stuck in place during bone remodelling. How and why this happens is not yet entirely clear. It can be the result of a previous measles infection, stress fractures, immune diseases, or genetics. It often requires either a hearing aid or corrective surgery. This entry was posted on Friday, April 15th, 2016 at 3:59 pm. Both comments and pings are currently closed.